Get full details on the powerful features of Oracle Database 11g from this thoroughly updated Oracle Press guide. 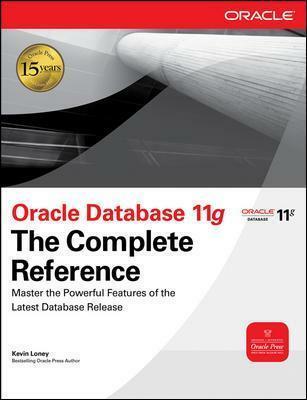 Oracle Database 11g: The Complete Reference explains how to use all the new features and tools, execute powerful SQL queries, construct PL/SQL and SQL*Plus statements, and work with large objects and object-relational databases. Learn how to implement the latest security measures, tune database performance, and deploy grid computing techniques. An invaluable cross-referenced appendix containing Oracle commands, keywords, features, and functions is also included. Get full details on the powerful features of Oracle Database 11 g from this thoroughly updated Oracle Press guide. Oracle Database 11g: The Complete Reference explains how to use all the new features and tools, execute powerful SQL queries, construct PL/SQL and SQL*Plus statements, and work with large objects and object-relational databases. Learn how to implement the latest security measures, tune database performance, and deploy grid computing techniques. An invaluable cross-referenced appendix containing Oracle commands, keywords, features, and functions is also included.